For example, what if a person finds the love of his or her life after the case has ended? Before we get to my thoughts on this quandary, some background: When a case comes to conclusion and applications for relief to remain in the United States have been denied, the immigration judge enters an order of removal against a respondent. Unless that decision is appealed, ICE can execute the judge’s order and effect an individual’s physical removal (more commonly known as deportation) from the United States. The Immigration and Nationality Act and the regulations at 8 C.F.R. 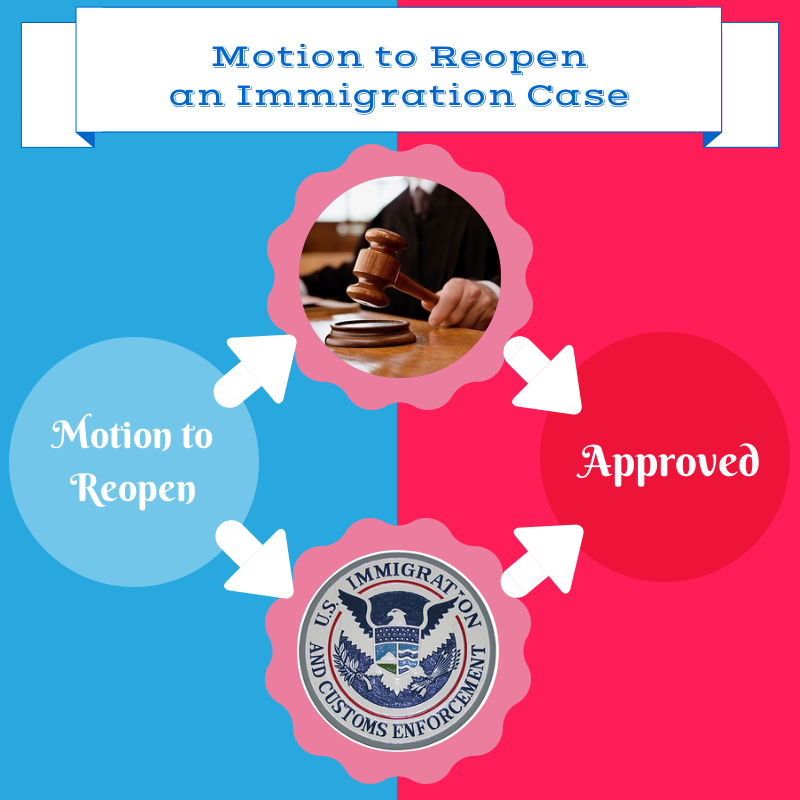 § 1003.23 allow an immigrant to file a motion to reopen with the immigration judge if certain criteria are met. In addition to satisfying certain procedural requirements, the motion must assert that “new facts” have arisen since the case’s conclusion which necessitate a new proceeding in front of the court. The motion should be accompanied by supporting evidence, a legal brief laying out the pertinent authority to convince the judge to grant the request to reopen, and a filing fee (currently $110.00). If the judge is persuaded, an order is issued to reopen proceedings; if not, the previous decision remains undisturbed. ICE is authorized to exercise prosecutorial discretion in determining whether to agree to join a respondent’s request for reopening of proceedings. According to a May 2001 memorandum by Bo Cooper, who was then General Counsel of the Immigration and Naturalization Service, the government may join in a motion to reopen if the immigrant were statutorily eligible for a green card, the visa petition has already been approved, and the immigrant merited “a favorable exercise of discretion.” Criteria such as the presence of family members in the United States who would experience hardship in the immigrant’s absence and the lack of a criminal history would augur in favor of ICE’s exercise of discretion. In practice, one submits all of the evidence that would accompany a motion to reopen directly with the ICE Office of Chief Counsel instead of with the immigration court. ICE would then review the submission and give a thumbs up or a thumbs down. This course of action has two significant benefits. First, if ICE agrees to a reopening, the immigrant saves $110.00 because the filing fee is waived under 8 C.F.R. § 1003.24(b)(2) . . . AND since both parties agree, reopening is essentially guaranteed (although ICE does reserve the right to contest any issues in front of the judge in the reopened proceeding). Second, if ICE declines to join, one would take the motion and supporting documents and THEN file it with the immigration court. Essentially, a second bite at the apple. So, to answer the questions posed at the top of this post, there IS a way to get back in front of the judge for individuals who want their cases reopened — and a favorable exercise of prosecutorial discretion by ICE can go a long way toward achieving that result. I have been successful in numerous instances with clients seeking to reopen their cases, sometimes with ICE’s cooperation, and even without it. Every case is unique and different. Past success stories are not a guarantee of success in future cases. (It’s also called complacency and “resting on one’s laurels.”) If you feel that you may be a good candidate for a motion to reopen, I invite you to contact me.